"I learned so much from watching the girls and how they work. Lindsey was so patient with me and let me ask any question. She taught me how to remember what color goes with what quadrant. The lower right is red and it is fire, the upper right is black that is because smoke comes after fire. Then you go to the lower left and that is white because after smoke comes ashes. Last but not least you have the upper left and that is green because after ashes comes new growth. She helped me remember how the reverse curve wire goes and how it works, frown down smile up. I also learn how to properly clean a room after each patient, and how to clean the instruments. The instrument name took me a little longer to remember but after seeing what each instrument was used for it helped me to remember then. I loved getting to watch Lindsey take the pictures for the Invisalign. Out of all getting to watch the process of putting on the brackets for the first time was the best. Y'all walked everyone through the process and made sure they where comfortable through the whole thing that’s what I liked best. I didn’t get to see anyone finish their time in braces but I can only image how it must feel to help a child or an adult feel better about their smile. Thank you so much for having me and teaching me all that y'all did. I couldn’t have asked for a better place to do my externship." If you are looking for a Longview orthodontist and would like to learn how Dr. Spencer Mack and Dr. Andrew Hansen can help you get the smile you have always wanted with metal braces, clear braces, or invisalign please contact us. Our free consultation will allow you to discover what our orthodontists can do for you. We’re conveniently located in Longview, TX next to Longview Regional Hospital and are just a quick drive from Kilgore, Marshall, Gilmer, Henderson, Mount Pleasant and Carthage Texas. Today’s post is on one of the more esthetic options in orthodontic treatment, invisalign. If you have been wondering how invisalign works we are here to help clear some things up. As orthodontists, Dr. Mack and Dr. Hansen make teeth move using different tools. One of the most commonly used tools is braces (brackets and wires). Invisalign is also one of those tools they use to move teeth. How the process works here at Mack and Hansen Orthodontics is pretty simple. It starts with a FREE consultation where we get some diagnostic x-rays and photos, and then Dr. Mack or Dr. Hansen take a look at your teeth and bite and visit with you about what your concerns are. Since Dr. Mack and Dr. Hansen are comfortable treating even the most complex cases with invisalign, if you feel invisalign is a good fit for you and fits your lifestyle then we can get you started that same day. To start, we simply scan your teeth with our intraoral digital scanner. We use the digital scanner instead of taking gooey impressions to not only make your experience better, but it also allows us to have a more accurate record of your teeth and therefore better fitting trays. After your scan, Dr. Mack and Dr. Hansen plan each and every tooth movement from the start of your treatment to the end to give you the most effective, efficient, and beautiful result. When you return to our office after your scan we provide you with trays and place any attachments on your teeth. Attachments are little tooth-colored bumps of glue that help the invisalign trays transmit the appropriate force to your teeth so they can move how they are supposed to. We also include a bleaching kit with each invisalign treatment, so you and whiten your smile while we are straightening your teeth and aligning your bite. And to answer the Trivia Tuesday question: Yes – we can correct overbite and underbite with invisalign using rubber bands. You typically wear your invisalign trays for 7 to 10 days at a time, and we see you for visits every 8-12 weeks. Once we finish going through your first set of trays, we evaluate where your smile and bite are at, and if we need any more trays to get things just the way want, then scan to get you some extra trays. After you finish your treatment, you still need to wear retainers just like after any other form of orthodontic treatment. Please let us know if you have any questions about Vivera retainers. If you are looking for a Longview orthodontist and would like to learn how Dr. Spencer Mack and Dr. Andrew Hansen can help you get the smile you have always wanted with metal braces, clear braces, or invisalign please contact us. Our free consultation will allow you to discover what our orthodontists can do for you. We’re conveniently located in Longview, TX next to Longview Regional Hospital and are just a quick drive from Kilgore, Marshall, Gilmer, Henderson, Mount Pleasant and Carthage Texas. As some of you may already know, October is National Orthodontic Health Month. Some may ask why October, of all months, is Orthodontic Health Month. Many will consider that since Halloween is in October, it is a great month to bring awareness to the proper way to take care of your teeth while undergoing orthodontic treatment. Now we all know that with Halloween comes Trick-or-Treating which means lots and lots of candy and sweets. While some of you may not have gone Trick-or-Treating this year due to the rain and storms here in Longview, Kilgore, Marshall, and Gilmer. There are obviously a number of reasons why it is important to minimize sweets and candy intake, especially during orthodontic treatment. Candy and other sweets obviously have lots of sugar in them. Sugar, of course, leads to cavities for whoever is eating them, even adults, if proper oral hygiene is not up to par. During orthodontic treatment with braces or invisalign it takes more effort to properly take care of your teeth and gums. Having excessive amounts of candy during this time of year means it is of upmost importance to brush and floss your teeth. Another important thing to remember while going through all of that trick-or-treating candy is that the hard candies are typically the ones that will cause brackets to come off and orthodontic wires to bend, which can cause delays in orthodontic treatment and hinder your orthodontic treatment progress. Furthermore, sticky candies can get stuck between the brackets and wires as well. As an alternative to eating all that candy this year, bring it out to our Candy Give-Back Drive taking place Saturday November 3rd here in Longview at Menchie's on Hawkins Parkway. In exchange for trading in your candy (which we will donate to Operation Gratitude), you will get a Mack and Hansen Orthodontics Toothbrush kit with a travel toothbrush and gift cards to local Longview restaurants including Menchie's, Bubba's 33 on Loop 259, and other restaurants. Are you interested in orthodontic treatment but don’t want to go with traditional braces? Here at Mack and Hansen Orthodontics we love when our patients opt for Invisalign clear aligners as their treatment option. 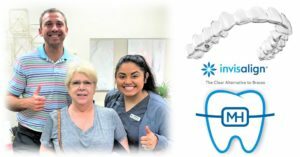 Invisalign offers a number of benefits to patients, most notably the convenience of being able to take their trays in and out when they choose, such as for social gatherings, parties, and of course to brush and floss their teeth. For our patients we actually do not take molds/impressions of your teeth. Instead, we use our digital scanner to scan your teeth and bite. This gives us trays that fit more comfortably and accurately than when you have molds taken. Typically, orthodontic treatment with invisalign lasts between 9 and 15 months, depending on the complexity of the case. However, there are cases that take longer and some that are shorter, again it all just depends on what needs to be done to your teeth. Our orthodontic consultations are free of charge and we use those to determine what your specific treatment needs are. Another nice thing about invisalign is that you can bleach your teeth with the trays in your mouth, giving you the opportunity to whiten your smile at the same time you are straightening your teeth. We now include a bleaching kit with all of our invisalign treatment options!